After inheriting the money, Rakewell is surrounded by hangers-on in the form of musicians, artists and others set on teaching him, presumably as a way of lining their own pockets. 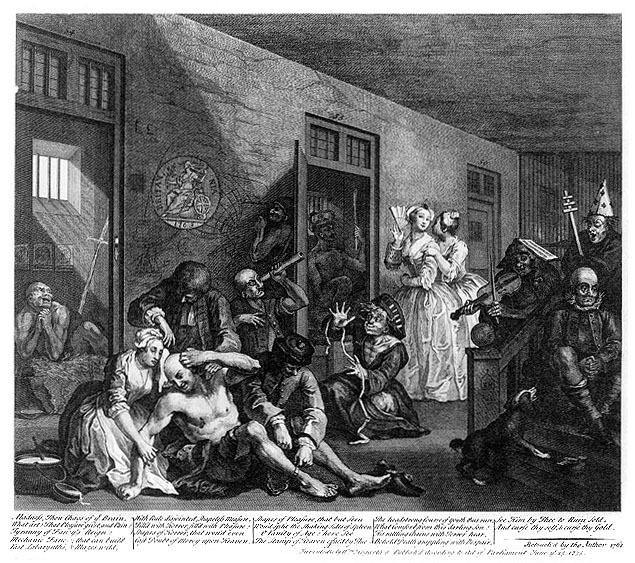 Hogarth manages to let a complex, multi-layered story unfold over a series just eight frames. There is the servant he has wronged and is trying to buy off in the first picture, who is by his side at the end of his life. There are those who exploit his ideas of grandeur for their own ends. There is Rakewell’s own attempt to restore his fortune by marrying a rich but ugly older woman (with the same loyal servant appearing in the background holding his child). 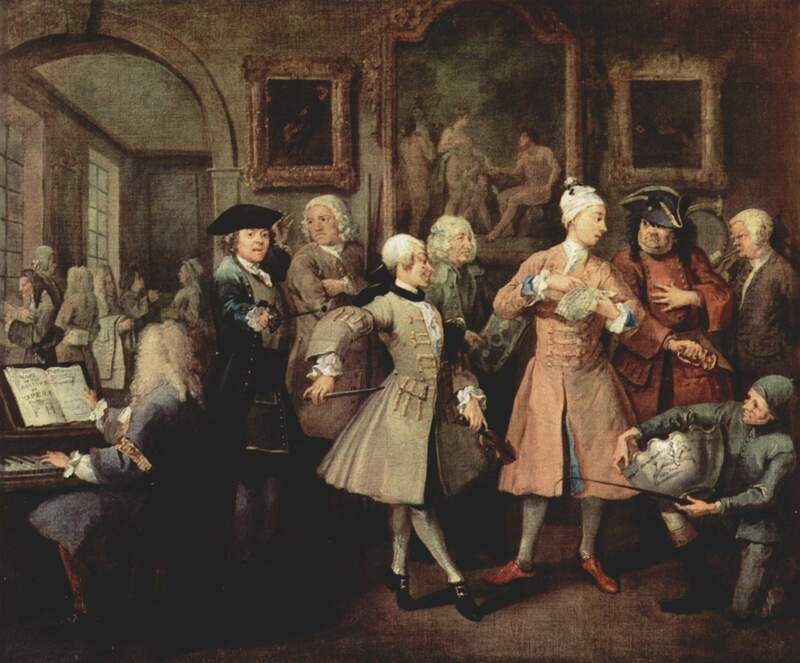 One of the things that interests me about A Rake’s Progress, quite apart from the fact that it has spawned interesting reworkings by other artists (about which, inevitably, more to follow), is the way Hogarth himself used the paintings as a way to sell the prints. 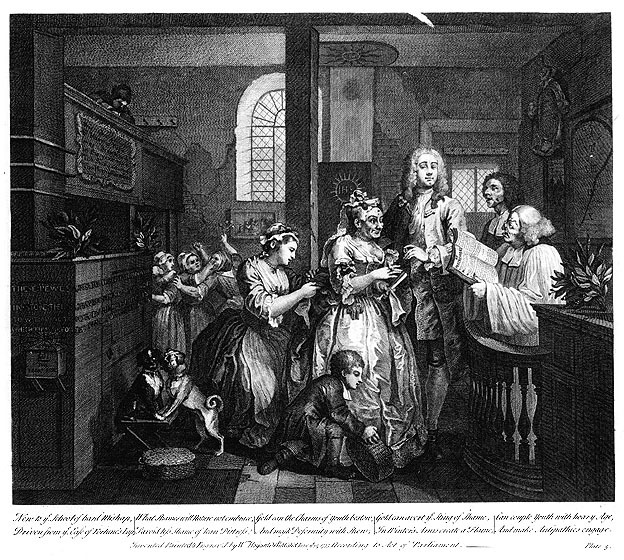 In 1734, Hogarth advertised the work, inviting potential subscribers to view the paintings at his studio; they could then subscribe to the series of engravings. This seems to turn out understanding of advertising on its head really. An advert is generally a copy, something highly reproducible, though it may be promoting something unique (although more often than not, that which is being advertised is also reproducible given that we live in an age of mass-production). Hence, Hogarth’s use of the unique to promote the multiple seems counter to our understanding of advertising. 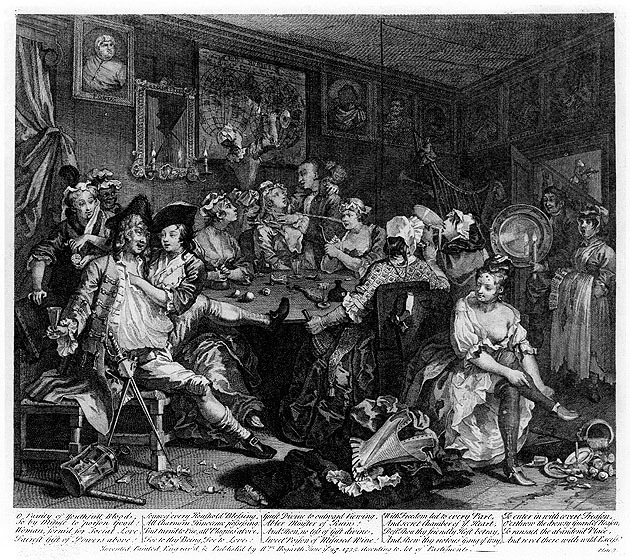 In art though, arguably multiples – or drawings or test works made while planning larger pieces – are often used as a way to provide a more regular income stream whereas larger, unique works need either public funding or the investment of major collectors or benefactors, so perhaps Hogarth was just being more honest about that process than big name contemporary artists would be likely to be. Given that A Rake’s Progress is a morality tale, it’s perhaps unsurprising that it’s a work with an enduring hold and that the contemporary reworkings have found something new to say while fundamentally telling the same story. After all, everything changes, everything stays the same. 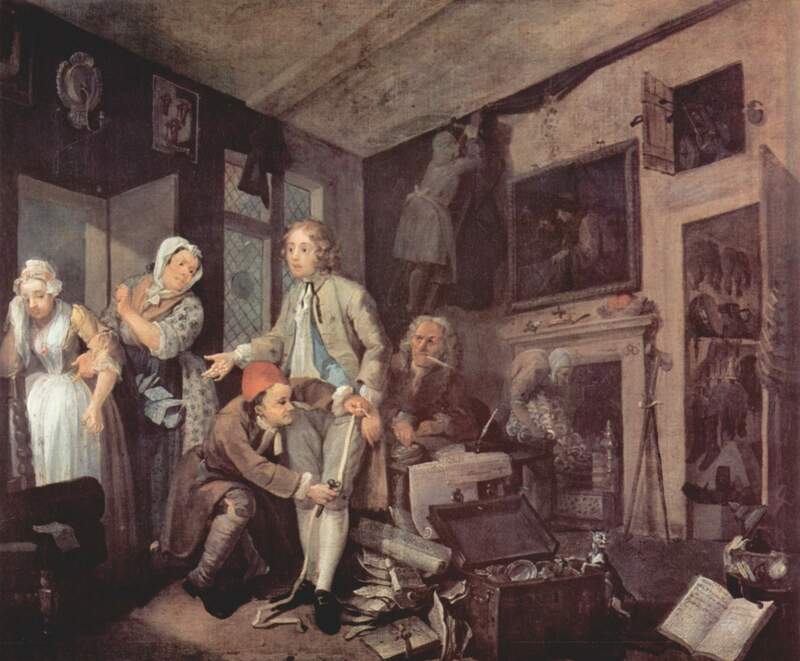 William Hogarth’s series of paintings A Rake’s Progress are in the John Soane Museum, a fascinating place well worth a visit for more reasons than it’d be possible to list. This entry was posted in Painting, Printmaking and tagged A Rake's Progress, art, engraving, painting, printmaking, William Hogarth by Ann Jones. Bookmark the permalink. Abbot Hall in Kendal are currently showing David Hockney’s version (until September). That’s all set to be the subject of my next post. Didn’t know it was on show at the moment though, so many thanks for the heads up; now I can include a link and look more timely than I’d expected!